A Rope Ladder is a great eco toy for outdoor fun. This Rope Ladder, available from Magic Cabin, is made of sanded hardwood rungs. The nylon rope is the least eco-friendly part of the toy, but a more natural fiber would not hold up to outdoor weather. The Rope Ladder is rated for children 5 years and older; however, we have had a rope ladder hanging from a tree since my daughter was three-years-old. Our ladder came from Ikea, but it appears it is no longer available. 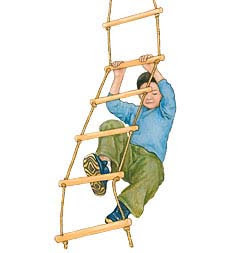 Climbing on a Rope Ladder is more challenging than climbing a stationary ladder, thus it helps continue the gross motor development of older children. A Rope Ladder swings as a child climbs making the task more challenging. A Rope Ladder could be hung indoors, as well, but we are always looking for outdoor toys that don’t crowd our small cabin. I found your blog via Google while searching for ladder climbing and your post regarding Rope Ladder Gross Motor Fun looks very interesting to me. I always enjoy coming to this site because you offer great tips and advice for people like me who can always use a few good pointers. I will be getting my friends to pop around fairly soon.